When the demands of their individual careers proved too great, it seemed to spell a premature finale for possibly one of dance music’s most gifted acts. But through ‘You Once Told Me’, fate has intervened. Songstress Mavie Marcos and DJ/producer Josh Gabriel (Gabriel & Dresden) are finally set to deliver their first full-length track collection. 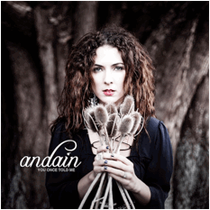 Explaining Andain’s unique production dynamic, Mavie says: “We blended natural acoustic sounds throughout the album with electronic percussive ones. We made sure to keep our musical sound pallet made up of our drum kits and analogue synth sounds, consistent throughout. We thought this would result in the most intricate album for the listener - something that is meant to be listened to, in its entirety, as a cohesive piece of music - not just a string of singles. The combination of Mavie’s classical and rock background with Josh’s never ending love of early-80s new wave works well. Crafted for a different type of floor, its 11 tracks are filled with translucent melodies, unhurried beats, leading edge FX wizardry, all matched to Marcos’ intriguing, elliptical song writing. It’s out September 24.